A view of the Antarctic ice sheet. Antarctica’s icy mantle hides a truly fantastical world, and we’re still trying to understand its contours. Case in point: a new study has revealed three monstrous canyons on par with the Grand Canyon. The discovery is both wow-worthy and vital to understanding what will happen to Antarctica’s ice as it melts. Scientists have long wondered what’s under the ice near the South Pole. Ice-penetrating satellites have helped researchers get a grip on the bedrock in other parts of the Antarctic, but their paths don’t take them over the pole. The gap—dubbed the polar hole—is basically here be dragons territory for ice researchers. But understanding the region’s under-ice topography is important, because it can tell researchers how the West and East Antarctic Ice Sheets—the continent’s two main stores of ice—interact with each other and how the rate of ice flowing to their margins may change. That’s particularly important in West Antarctica, where some coastal glaciers could be entering an extremely unstable state, increasing the risk of catastrophic sea level rise. To get a grip on this under-ice terra incognita, scientists flew a plane with radar over the pole. The results, published this month in Geophysical Research Letters, show that in addition to the mountains the researchers expected to find, there are three gaping canyons between them, of which two have never been observed before. 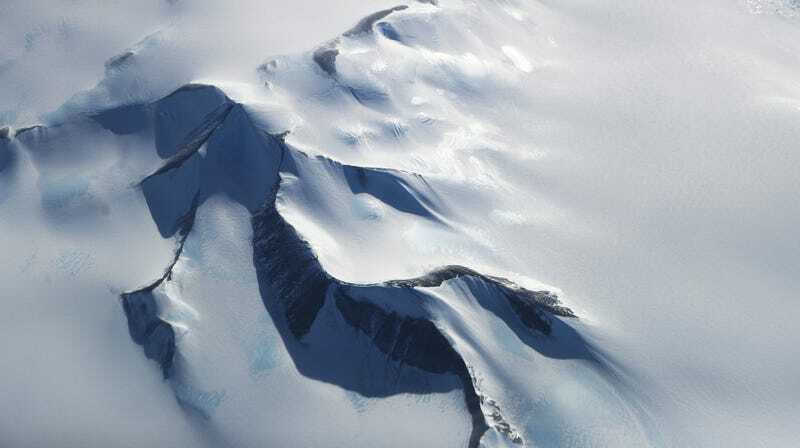 “We expected to find mountainous subglacial topography but the size of the troughs did come as a surprise because we had no indication that they were there,” Kate Winter, a researcher at Northumbria University who led the study, told Earther. The biggest of the troughs—dubbed Foundation Trough—is 350 kilometers (218 miles) long, up to 35 kilometers (22 miles) wide, and 2,000 meters (6,260 feet) deep. For a little perspective, the Grand Canyon runs 446 kilometers (277 miles) long and maxes out at 28.8 kilometers (18 miles) wide and 1,829 meters (6,000 feet) deep. A rendering of the mountains and canyons below the ice. The other two sub-ice canyons—named the Patuxent Trough and Offset Rift Basin—are also impressive in scale, making this one of the more exciting Antarctic discoveries in a while. “[It’s] still amazing that there are pieces of out planet we do not even know what the topography looks like,” Robin Bell, an Antarctic expert at Columbia University’s Lamont-Doherty Earth Observatory, told Earther. But this study is about far more than the cool factor. The canyons are near a major divide that separates East and West Antarctica. Understanding the topography there can inform scientists about how changes on either side of the continent could affect the other. West Antarctica in particular has been an ongoing area of concern for scientists. Warm water has been nibbling away at its edges, creating more unstable conditions for the remaining ice. Some research has suggested that it could eventually create conditions ripe for the collapse of the coastal glaciers holding back the larger ice sheet. That could cause seas to rise at least 10 feet. That won’t all happen at once, of course, and the new research is one way for researchers to understand how long it could take. In looking at the what’s in the ice layers, Winter said the ice around the divide has likely been stable for millennia. The topography also shows that it’s unlikely that ice from East Antarctica could start to flow toward West Antarctica if that region goes into a full blown meltdown. This is good. But the canyons could speed the meltdown itself. This is not good. “If the West Antarctic Ice Sheet starts to thin and shrink in size, an increase in the speed at which ice flows through these troughs could lead to the ice divide moving and increase the rate at which ice flows out from the center of West Antarctica to its edges,” Winter said. The next step is to work out the details of how these processes could play out, something Winter said she and the other researchers on the study plan to do by working with ice modelers. “Knowing where ice can come from helps us understand how the ice will change in the future,” Bell said.